It is an aluminum part without any servo and control plate . A single leg unbend about 23 cm, body shell is about 17.5 cm long, about 15.5 cm wide. Each leg has three joints, robot can complete forward, backward, turn, dancing, climbing and can perform all kinds of action. Could realize go forward, backward, turning, dancing, climbing movements, etc. 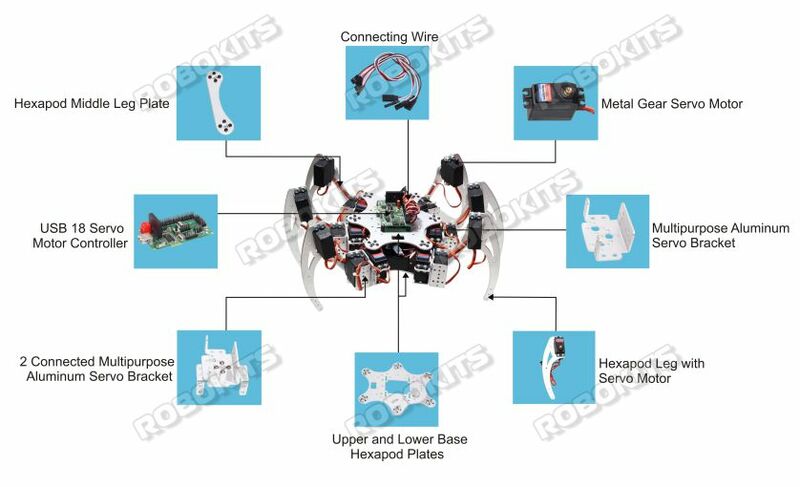 18 x Metal Gear Standard Servo Economy Optional RKI-1211 Digital Servos can be bought to enhance performance. Product quality is good. Coding of Arduino is very easy with the Robokits software.